The Youngstown State women's basketball had a cold spell come at the wrong time and fell 71-58 at Wright State on Thursday evening. The Penguins cut a 10-point deficit down to two at 55-53 with just over seven minutes remaining in the game. Indiya Benjamin had a runner rim out on their next possession that would have tied the game, and YSU went on to miss eight consecutive field-goal attempts. Benjamin finished with a team-high 16 points, but she also committed eight turnovers. Mary Dunn posted 13 points while foul trouble limited her to 19 minutes of action, and Morgan Brunner came off the bench to record career highs of 10 points and nine rebounds. Both of Wright State's starting posts had double-doubles as Symone Simmons had 17 points and 12 rebounds, and Lexi Smith registered 14 points and 16 rebounds. Wright State had 20 offensive rebounds and converted them into 21 second-chance points. Youngstown State scored the first six points of the contest on 3-pointers by Benjamin and Alison Smolinski, and the Penguins' final lead came at 8-5 on a Dunn basket with 6:49 left in the opening period. The Raiders went on an 8-2 run, and they extended their lead to 17-12 with 2:24 remaining left in the opening stanza. Simmons hit a jumper to put the Raider ahead 21-15 just over 90 seconds into the second period before YSU went on an 8-2 run to tie the score at 23 on Brunner's 3-pointer. The Penguins did not score for the final 3:34 of the half, which allowed the Raiders to take a 30-23 advantage into the locker room. Kelley Wright made four 3-pointers in the first five minutes of the third period as YSU trimmed the deficit down to 40-38. Wright State ended the period on an 11-3 spurt to go up 51-41 entering the fourth, and the Raiders led by 10 again at 55-45 with 8:25 left. That's when the Penguins made one final push. Brunner scored five straight points on a 3-pointer and two free throws, and Benjamin followed with a triple to make the score 55-53 with 7:10 remaining. YSU made one field goal the rest of the game. 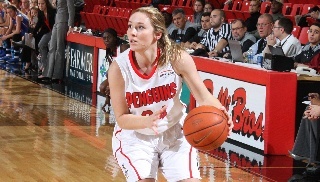 Youngstown State will conclude its three-game Horizon League road swing at Northern Kentucky on Saturday at 7 p.m.